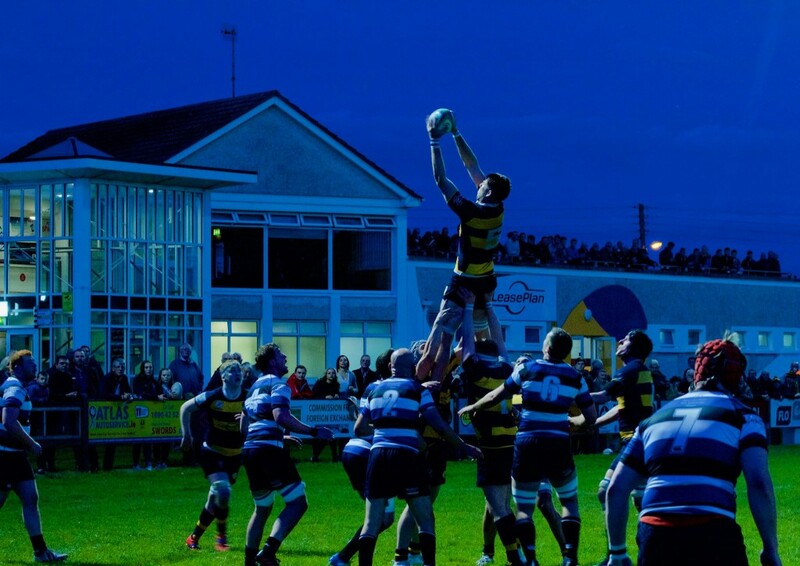 It was a perfect night in Skerries for the meeting of Skerries and Wanderers in the AIL Division 2B clash. Both teams opened their campaigns last week with try bonus points wins, Skerries away to Dungannon and Wanderers at home in the Aviva Stadium to City of Derry. The last time these teams met a last minute try and conversion saw Wanderers edge the game by 20-19 so a tight game was expected. The big crowd for “Friday Night Lights” saw Wanderers set the early pace but excellent scrummaging by the Skerries pack saw Skerries hold out and clear their line. Skerries started to take control and in the 8th minute indiscipline by Wanderers saw them lose a player to the sin bin for 10 mins. Skerries were now playing all the rugby and kept Wanderers pegged deep in their 22. The young team’s ambition showed in the 14th minute when they turned down 2 kickable penalties in quick succession and moved the ball across the park creating an opening for Michael Turvey to crash over in the corner for the opening score of the game. A difficult kick from out by the touchline failed narrowly 5-0 Skerries. Skerries continued to push Wanderers back but in the 23rd minute a rare foray into the Skerries 22 saw Wanderers go over in the corner to level the scores. Skerries continued to push Wanderers back and the lineout with Joe Glennon and Tom Mulvaney ruling the skies was putting huge pressure on Wanderers. In the 37th minute this pressure told when rather than kick to touch the Wanderers out half kicked straight into the hands of Eddie O Mahony on the Skerries 10-metre line. Eddie ran it straight back at the Wanderers defence and some deft foot work saw him evade 4 tackles before offloading to Dara Lownes who ran in under the posts to restore Skerries lead. Billy Mulcahy added the conversion. From the restart Skerries struggle to clear their lines and Wanderers were awarded a penalty on half way. The Wanderers full back Garrett O Suilleabhain blasted his long-range effort through the post and the teams went into the half time interval with Skerries deservedly leading 12-8. The cliché of “a game of two halves” was very evident in the opening 15 minutes of the second half. Wanderers came out all guns firing and within a minute of the restart had scored their second try. Wanderers continued to push Skerries back and some huge tackles by captain Mickey Sherlock and Conn Marrey kept the line intact. In the 48 minute Skerries were awarded a penalty on half way and decided to move it quickly but the ball went to ground and Wanderers kicked through and touched down at the posts. Wanderers were now leading 20-12. Wanderers continued to run at the Skerries defence with their big forwards creating space for the pacey centres to exploit. Ross Gordon at full back was called on to make some try saving tackles as Wanderers pushed for their bonus point try. In the 53rd minute they got their reward when prop Diarmuid Higgins crashed over for their 4 try. Skerries rang the changes with Ruari Woods, Maurice McAuley and George Harrington all introduced into the fray. The fresh legs gave Skerries new impetus and excellent hands and foot work from Paul Devitt and Ruari Woods saw Skerries go close. They recycled and probed the Wanderers defence and on the back sustained pressure created an opening for Maurice McAuley to go over in the corner for their 3rd try. The difficult conversion was narrowly missed and Wanderers lead was now cut to 27-17. Wanderers responded immediately and went over in the corner for their 5th try of the evening. The conversion was successful and Wanderers lead was now out to 34-17. At this point teams can lie down and accept their faith. But not this young Skerries team. They went for it! Skerries with big carries from their pack kept Wanderers going backward. Ruari Woods was getting quick ball and continued to mix up the play between backs and forwards. Wanderers under pressure started to concede penalties and in the 73rd minute the referee lost patience and sin binned a Wanderers player. Skerries turned the screw and with carries into the heart of the Wanderers defence and some excellent ball retention by Jim Mulvaney saw the defence sucked in and created the space for Paul Devitt to go over under the posts for the bonus point try. Devitt converted his own try to leave the score at 34-24 to Wanderers. It was all to play for with Skerries now needing a single score to capture the losing bonus point. From the re-start Skerries were camped in the Wanderers 22. They continued to move the ball across the line probing for a gap. Phase after phase saw them get closer to the line. An excellent move through the middle saw Wanderers stray off-side , with the penalty advantage ,Skerries moved the ball quickly through the hands creating a space in the corner only to be denied by a knock-on. The referee called them back for the penalty- the final play of the game – and Devitt converted for 3 points and a priceless 2nd bonus point. The game finished 34-27 to Wanderers. Deserved winners on the night but the 2 bonus points gained by Skerries and more importantly the spirit and attitude shown by the whole squad was a victory in itself.